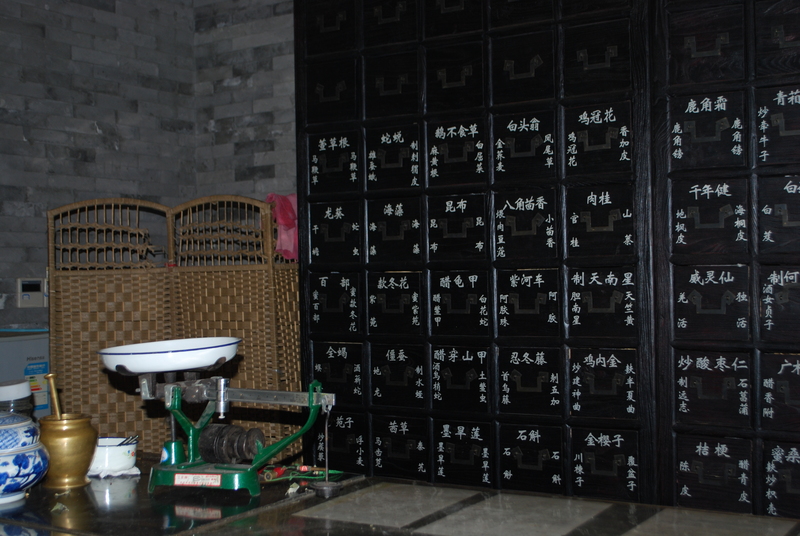 The giant apothecary in Beijing’s Chinese College of Medicine rose up before us with hundreds of drawers containing all the herbs necessary for health and wellness. The tour guide led us to the second floor where exam rooms peeked out from the walls. We entered a spacious room where bean bags huddled in the middle in the shape of a cube. Soft benches skirted the perimeter with wooden tubs positioned in front. Several young women entered with buckets of hot water and filled the tubs in preparation for those daring explorers fancying a foot massage. One of the pharmacists recounted a short history about the Chinese practice of preventative medicine; they visited the doctor on a regular basis to maintain their health – unlike the Western way of going to the doctor only when we were sick. He presented us with an opportunity to have a brief consult with one of the professors. The professors spilled through the doorway dressed in white lab coats, followed by nurses and translators. I was intrigued by their unobtrusive way of identifying trouble in the body; physicians would ask the patients’ age, look at the tongue and measure the pulse. I wondered, knowing what I knew of my own health, what they might discover simply by measuring my heartbeat and taking a quick look at my tongue. A jolly white-haired gentleman sat beside me and grinned. He introduced himself through the voice of his nurse; when he spoke, he looked directly at me, treating me as if I understood every word of his language. I was impressed by his manner; he was attentive and considerate. He asked my age, (with the delighted outcome of him commenting that I looked young for my age), and asked to see my tongue. He counted the pulse in my wrists. His clear eyes looked into my mine as he reported his findings, his nurse translating: it seems you don’t sleep well, you are fatigued, you have poor blood circulation and have trouble with your joints. His solution: a hot bath to soothe the joints and a glass of milk before bed might aid your sleep. I was pleased by his ability to detect the symptoms of my disease, without the usual method of blood tests and a joint exam. He was a complete stranger who didn’t have knowledge of my diagnosis, but I was amazed by what he observed in a short five-minute session. I smiled at his simple answer. Who knows? Perhaps a hot bath and a glass of milk before bedtime would help me sleep. I like the idea of going to the doctor to maintain your health, rather than to regain it. I agree – there’s a lot to be said for preventative medicine. I hope you are well.